The Summer School is primarily intended for PhD students. 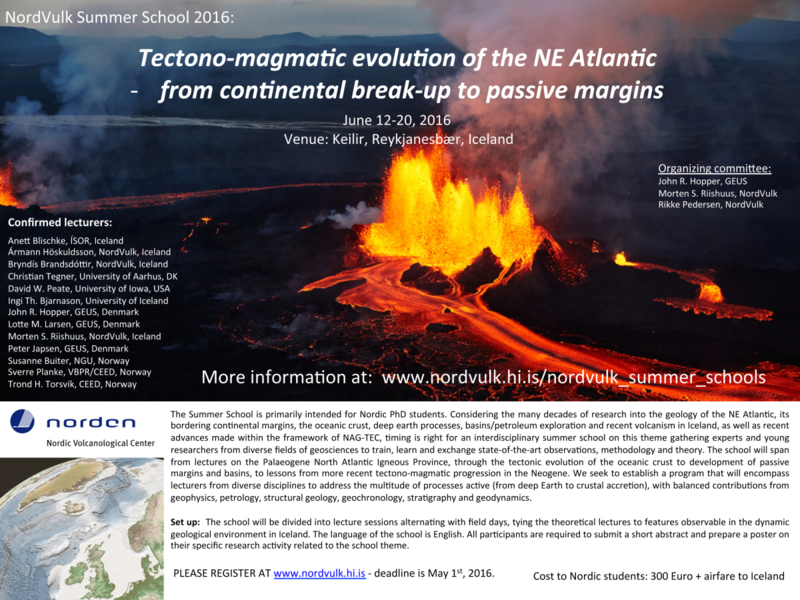 Considering the many decades of research into the geology of the NE Atlantic, its bordering continental margins, the oceanic crust, deep earth processes, basins/petroleum exploration and recent volcanism in Iceland, as well as the recent advances made within the framework of NAG-TEC, timing is right for a multi- and interdisciplinary summer school on this theme gathering experts and young researchers from diverse fields of geosciences to train, learn and exchange state-of-the-art observations, methodology and theory. The school will span from lectures on the Palaeogene North Atlantic Igneous Province, through the tectonic evolution of the oceanic crust to development of passive margins and basins, and to lessons from more recent tectono-magmatic progression in the Neogene. We seek to establish a program that will encompass lecturers from diverse disciplines to address the multitude of processes active (from deep Earth to crustal accretion), with balanced contributions from geophysics, petrology, structural geology, geochronology, stratigraphy and geodynamics. Set up: The school will be divided into four main sessions, where lectures will focus on specific topics (see program overview below). Three field days aim to tie together the theoretical lectures to features observable in the dynamic geological environment in Iceland. The language of the school is English. All participants are required to submit a short abstract and prepare a poster on their specific research activity related to the school theme. June 12: All participants meet at the Reykjavík Bus terminal (BSÍ) at 18:00. Transfer to the school location for dinner, a short introduction and practical information. June 19: Field trip 3, with final dinner and official closing of the school. June 20: Departures – all participants are responsible for their own arrangements. Registration and fees: Deadline for application is May 1th, 2016. An abstract is required to accompany all applications, as the participants are requested to present their own work on a poster at the Summer School. There is a maximum of 35 students admitted to the course, with a number of places reserved for Nordic participants. All participants are required to pay a registration fee of 300 EUR (non refundable), which covers tuition, course materials and transport during field trips. Furthermore, all participants must cover their own travel to and from Iceland, as well as accommodation in Iceland after the school (if required). For Nordic participants the cost of hotel accommodation and meals during the school is all covered by NordVulk. Students from other countries need to cover the additional cost of 800 EUR for hotel accommodation, fieldtrips and full boarding. Venue: This NordVulk summer school will be hosted at Keilir, situated at an old US airforce base at the Reykjanes Peninsula, close to the town of Keflavík.